Southeast Asia presents opportunities to experience unique languages, cultures, and different foods. It can be hard to take in everything while remembering to be a responsible traveler, but it’s really important to develop these new habits. It’s important to greet people in a culturally-appropriate way while traveling in Southeast Asia. The wai is used when greeting someone, saying goodbye, thank you, or even sorry. To properly wai, a person should put their palms together and bow their head. There are three levels of the wai depending on the respect you want to show the other person. With someone you’re comfortable with, the hands are positioned at the chest. To someone you don’t know as well or an elder, put your hands near your mouth. For someone of high respect, such as a monk, your hands should be near your forehead or eyes. When traveling across Southeast Asia, you might hear people refer to this greeting differently: wai in Thailand, nop in Laos, sampeah in Cambodia, or others to describe this type of greeting. In many parts of Southeast Asia, Buddhism plays an important role in people’s lives. Being respectful at a temple will show those around you that you care about the culture and beliefs of the community. When you go to a temple, dressing appropriately is always important. It’s best to wear a t-shirt and shorts, pants, or skirts that cover your knees. Feet are considered the lowest part of the human, and it’s disrespectful to point them a statue of a Buddha or to any person while sitting on the floor (basically, think of where the bottoms of your feet are facing, and just sit cross-legged instead). Shoes are not worn inside temples during visits. During a Rustic program, local leaders will teach you more about temples, which will help you adapt to the customs quickly. Shopping in Southeast Asia is incredibly inexpensive and there are fantastic souvenirs to buy for friends and family. I was shocked to see the overuse of plastic bags at markets and food courts. Currently, there is a movement to stop using plastic straws across the world. We’re realizing the massive waste we’re creating from single-use plastics such as straws, bags, and bottles. Do your part to care for the earth while traveling by packing a reusable straw, whether bamboo or metal, or by simply telling your server you don’t need a straw. Want to go even further? Buy a reusable bag (like this one that Rustic sells—all proceeds go to the Rustic Pathways Foundation) that can fit in a pouch smaller than your hand to bring with you to night markets. With this bag, you won’t need a single plastic bag, and you’ll also have some cool Rustic gear to show off to your friends. I always have a hard time remembering to say no to the straw or plastic bag, but once you get the hang of it, things get much easier. Thank you so much for reading about my Global Fellowship and some easy ways to become a more responsible traveler! Please check out the Rustic Pathways Foundation to find out how to get more involved! There’s still time to enroll in a Rustic Pathways student travel program this summer. Click below to request a copy of our free catalog today! As a high school student, Cate traveled to Australia, Costa Rica, Laos, Tanzania, and Thailand with Rustic Pathways. After traveling to Tanzania in 2016, she and two other Rustic students started Miles for Maji, fundraising events to raise awareness about the global water crisis and support Foundation education projects. 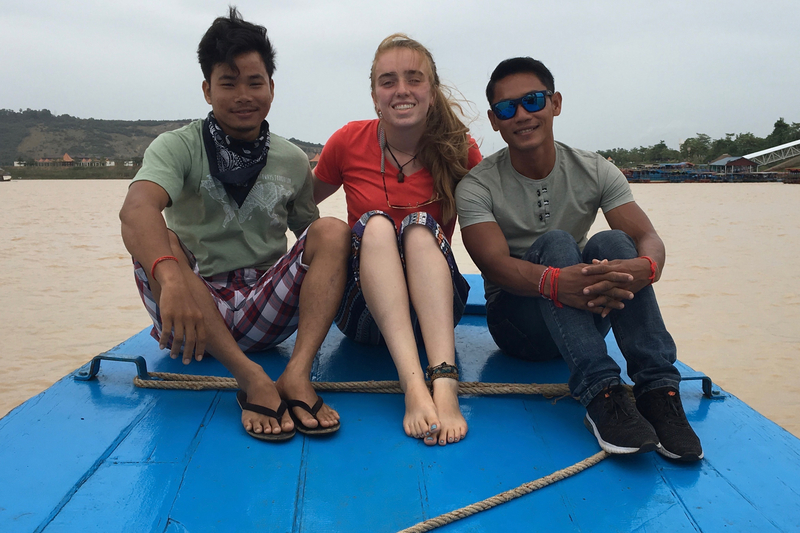 She became the first Rustic Pathways Foundation Global Fellow in 2018 and added Fiji and Cambodia to the list of countries she's visited with Rustic, in addition to returning to Laos and Thailand. Cate now attends Clark University in Worcester, Massachusetts.